Downton Abbey-What are we to do until Season Three? Downton Abbey wraps up its second season this Sunday. I can hear the collective moans now. How are we going to endure the many months until Season Three? The marriage that was to occur, didn’t. Poor Lavinia succumbed to the flu that had us thinking would kill off Lady Cora. And this was just after Lavina’s fiance, Captain Matthew, detected the stirrings of feeling in his legs and stood up. This recovery meant an impending marriage and children for Downton Abbey, a new heir was in the air (pun intended). Lady Mary’s hopes for a reconciliation with Matthew were reignited until her fiance, Richard, pushed her up against an elegant column and threatened her in no uncertain terms. I waited for her to slap him or at least tell him off, but no. She was as wussy as when Mr. Pamuk stole into her room. She’s all talk, no action. (Wait, there was a lot of action then). A marriage delayed, occurred. Anna and Mr. Bates were finally home free after his wife’s peculiar death. They had a night of wedded bliss, until the constable arrived and took him away in handcuffs. Even in death, the wicked wife haunts them and Mr. Bates is accused of her murder. A marriage, not meant to be, between Lady Sybil and the family chauffeur, now has the blessing of Lord Grantham. Yes, Branson, that handsome Irish rebel and Lady Sybil are to be married. With all these story lines drifting in the English countryside, what are we to do while we wait for the next few months? How about making our own story lines? 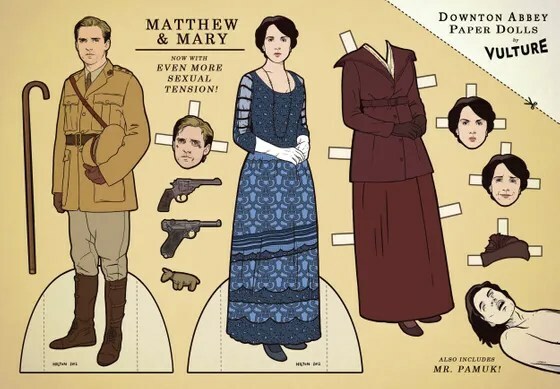 Here are four sets of Downton Abbey paper dolls created by Kyle Hilton. The other paper dolls are on Vulture’s site. You can click on them to see a bigger version—of the Dowager Countess, Matthew and Mary, Thomas and O’Brien and their villainous accessories, and Lady Sybil. Just find a few Popsicle sticks for the dolls and some construction paper to create your own set of Downton Abbey. That should keep you busy for awhile. And don’t forget those lurking background characters who are sure to make more trouble in Season 3: Cousin Patrick, back from Canada with amnesia and disfigured from the war, the conniving Thomas, and Richard. And I hear Shirley McClaine, yes our American S.M, is appearing on Season 3. The Dowager Countess Violet (Maggie Smith) is going to have some real competition now that Cousin Isabel is off to take care of the refugees. Shirley MacLaine signed on to play Martha Levinson, Cora’s American mother and intended rival to Violet. A MacLaine-Maggie face-off! 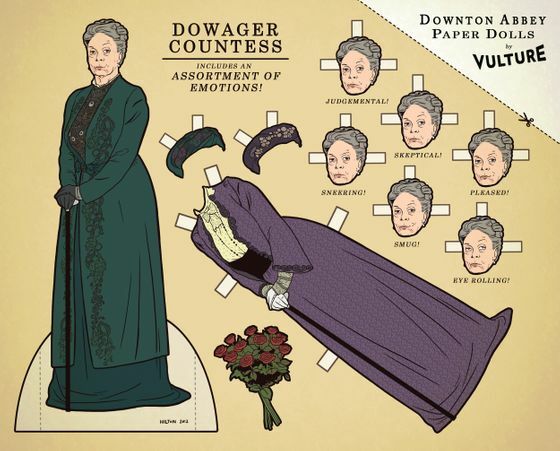 The designer of the paper dolls, Kyle Hilton, has wisely given us several Dowager Countess facial expressions to use during our play. (I love the eye roll myself). If you have no idea what I’m talking about, you can catch Downton Abbey in re-runs on American Masterpiece, PBS and affiliate stations. One more episode of Season Two before we bring out our Popsicle sticks. Previous postWhat’s a Red Dress Have to Do with It?